Friday 21st June at 7pm in The Bridge: Dundee West Church Hall, 132 Perth Road, Dundee, DD1 4JW. (Opposite Duncan of Jordanstone College of Art). 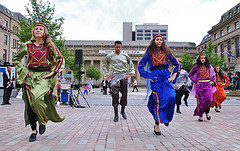 After their spectacular performance in Dundee City Centre last year, we are delighted to welcome back the Lajee Cultural Centre from Aida Refugee Camp near Bethlehem. A performance of dabke dance will be followed by refreshments and a talk on life in occupied Palestine. There will also be an exhibition of photography and artwork.The event is free but a donation will be appreciated. The event is supported by the Scottish Palestine Solidarity Campaign, Dundee University Action Palestine and Tayside for Justice in Palestine, with additional support from the Al-Maktoum College of Higher Education. This entry was posted in Dundee, Events, Lajee Centre, Meeting, Refugees and tagged Dundee, Lajee, Meeting, Occupation, Palestine, Refugees, West Bank. Bookmark the permalink.